Larne welcome rivals Carrick Rangers to Inver Park on Saturday (3pm) for what promises to be a spellbinding Irish Cup fifth-round showdown, writes John Gillespie. The Invermen, fresh from a 3-0 victory over Dundela, are riding the crest of a wave in Championship 1. Third in the table and four points behind leaders Bangor, they really are the surprise package this season and you can be sure they’ll be keen to send the Gers packing in the Irish Cup. Carrick’s scheduled league match at home to Lisburn Distillery was postponed due to a waterlogged pitch at the weekend. That means Gary Haveron’s men haven’t kicked a ball since Christmas Day when a dominant display against the Welders saw them lift the Steel and Sons Cup trophy in front of a bumper festive crowd at Seaview. With both teams in such positive form, the East Antrim derby has all the ingredients for what should be a fiercely competitive encounter. Fans of both clubs have been looking forward to the match since they were paired in the pre-Christmas draw. It was the Amber Army who were happiest after Carrick got the better of Larne when the two sides met in the league at Taylor’s Avenue in August, but with the potent strike force of Paul Maguire and Ciaran Murray regularly banging in the goals, Larne fans will be optimistic heading into this one. One of several interesting subplots is the head-to-head of two of the Irish League’s most promising young managers; Davy McAlinden and Haveron. McAlinden, a double-winning captain for Carrick in 2011, has impressed in his first full season in charge at Inver. 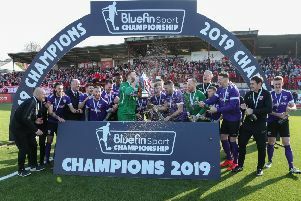 Haveron, a Larne native, already has a trophy on his managerial C.V.
Keep an eye on www.larnetimes.co.uk and www.carrickfergustimes.co.uk for more build-up to Saturday’s derby.